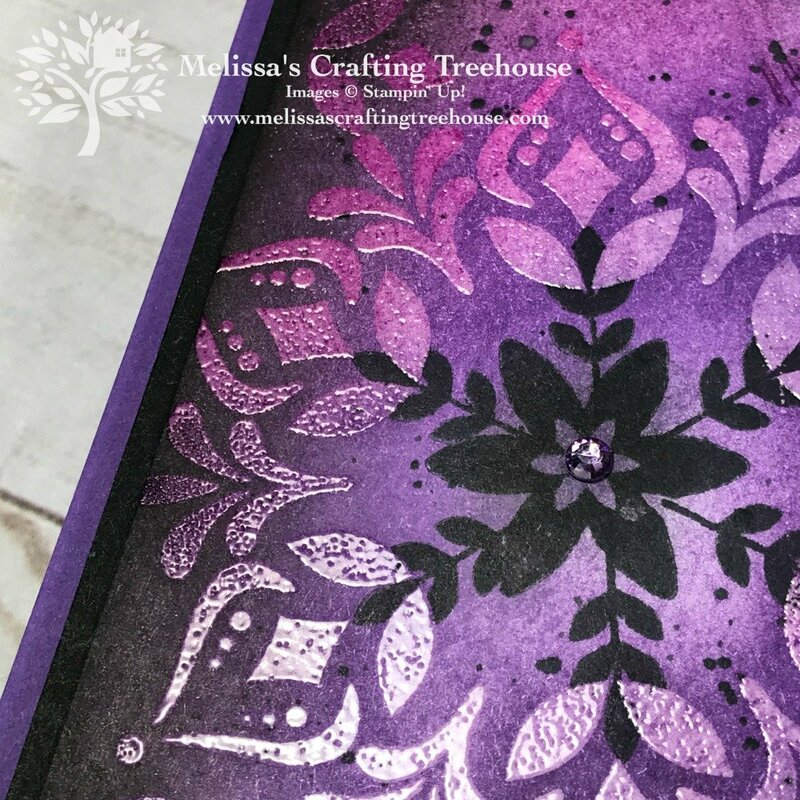 Today’s project is something I call Sponge Art but it actually includes several techniques including, heat embossing, an emboss resist, water coloring with acrylic blocks, splattering, and simple two-step stamping as well. It’s been a while since I’ve done a more artsy type card with my clubs. This stamp set inspired me to play with all these techniques and I truly had a blast. I was actually intending to do a technique called Josephs Coat but then my project sort of morphed into what you see here. Josephs Coat is another form of sponge art as well. 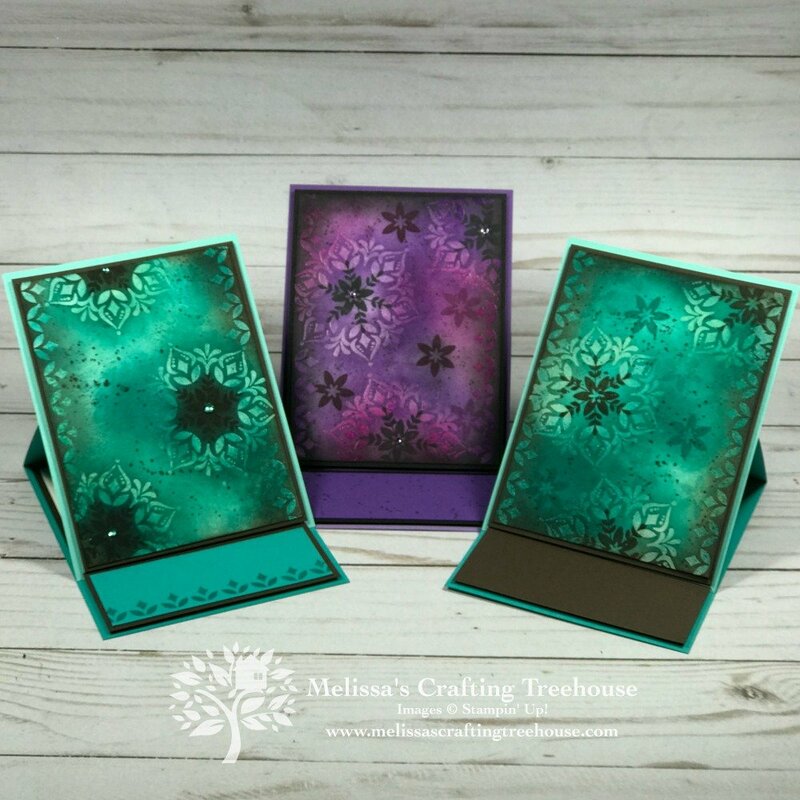 You should also know that this project features a stamp set called Happiness Surrounds which is part of the Snowflake Showcase limited time offer only available during the month of November (or while supplies last.) There are five products available through this promotion and one has already sold out! 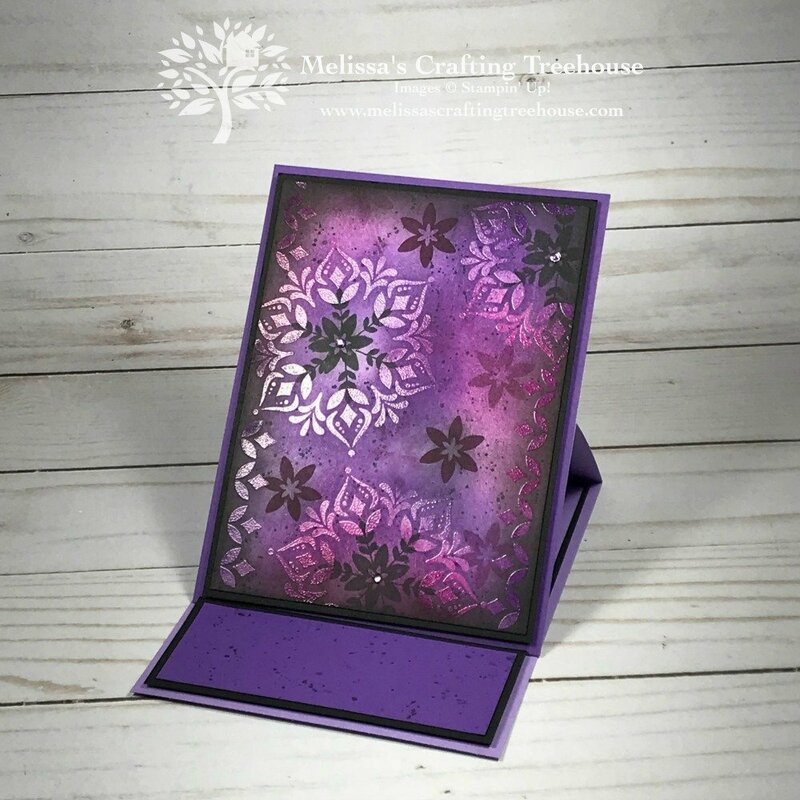 Click HERE to check out the other products in the Snowflake Showcase promotion. As you can see here I’ve in fact created two versions of this card in two different color schemes. So what do you think of the description of sponge art? While sponging isn’t the only technique used here it is what brings this focal piece together with the variation in the colors and with the lights and darks. I also love those gorgeous images and the effect of the splattering to top it off. I have not done a video tutorial for this purple color scheme however I do have a video for the other color scheme shown in the photo above. Aside from the alternative colors, there are a few differences in these purple sponge art versions which I will share here. Basic Black was used for the neutral color. Two images were stamped, one over the other (two-step stamping), with the Memento Black Ink in the center of each medallion. 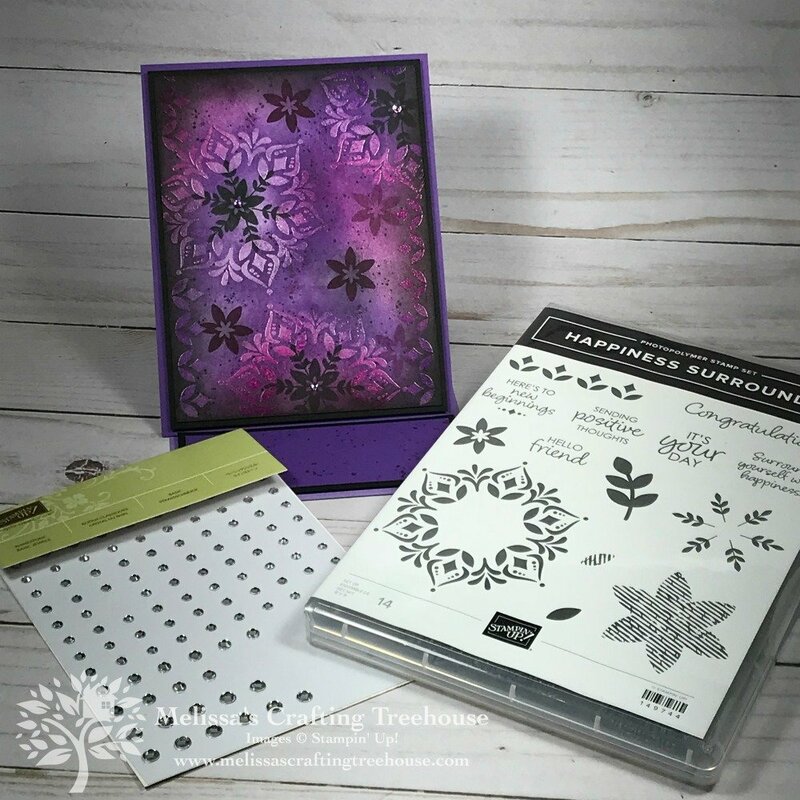 The floral image was cleaned and then stamped with first and second ink in Blackberry Bliss Ink, in the open spaces around the medallions. Three small Rhinestone Jewels were colored with the Dark Highland Heather Blends Alcohol Marker and placed in the center of each of the three medallions. 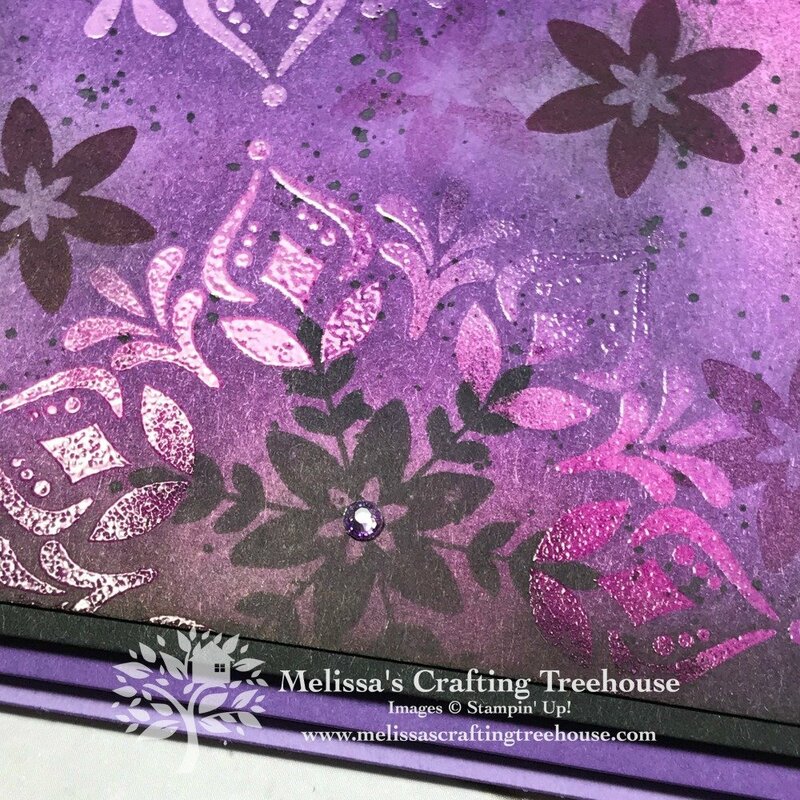 For the additional details about this Easel card please watch my video tutorial just ahead. Keep in mind each focal piece will turn out completely different! This is definitely one of those projects where you have to go with the flow and enjoy the process! Here are a couple of close-ups showing some of the gorgeous details in this card. Here’s my trio of sponge art cards. I hope you like them and will give it a try! Just be prepared to get inky fingers! LOL! Click HERE if you’d like to see more pictures and my blog post featuring this same card layout for the Color Fusers Blog Hop.